Lysol Disinfectant Spray kills 99.9% of viruses and bacteria. * It can be used on commonly touched surfaces in your home, on fabric and in the air to freshen. Help protect your family from germs they could come in contact with every day. (* when used as directed). Lysol Disinfecting Spray for use in the bathroom as a bath tub cleaner, shower cleaner, and toilet seat disinfectant. Lysol Disinfecting Spray can be used in the kitchen for sinks, garbage cans, and refrigerator exteriors. 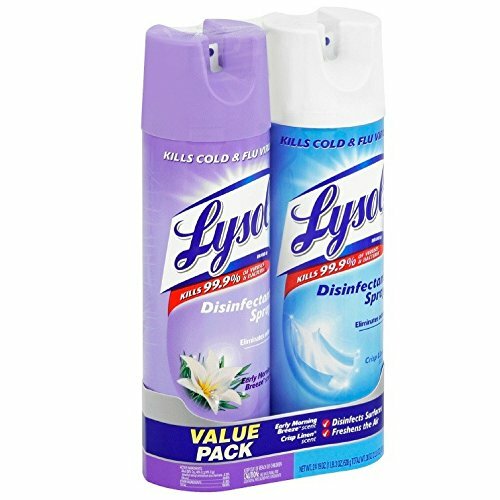 Lysol Disinfecting Spray can also be used in the home, on door knobs, diaper pails, and telephones. Lysol Disinfectant Spray can be used on soft surfaces including couches or sofas, mattresses, and pet beds. "Kills 99.9% of viruses and bacteria* (*when used as directed)"
Big D Ind Fire D One Shot After-fire Odor Control, 5 Ounce Aerosol Can Deodorizes Approximately 10000 Cubic feet -- 12 per case.